One smoked turkey, well-rested = one me, well-fed. 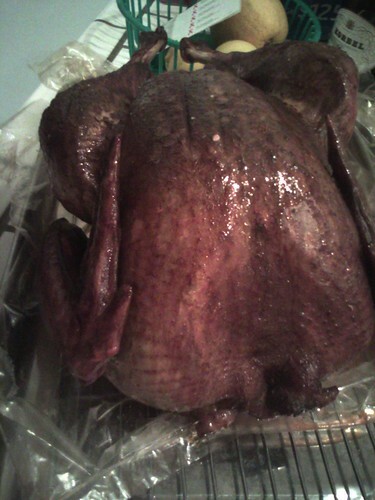 That is one good-looking turkey, eh? It was quite tasty too. 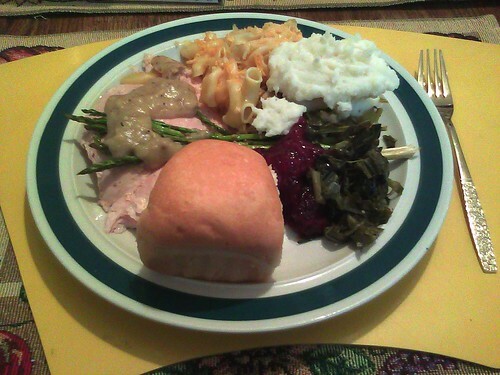 Here’s my plate of the Thanksgiving meal. From left to right Going clockwise starting with the turkey with asparagus on top with gravy on top of that, there’s some mac and cheese, mashed potatoes, stuffing completely hidden under the mashed potatoes, greens, cranberry relish (with orange), and a roll with butter. Admittedly, this was plate 1 of 2. On the health-conscious side, I didn’t have any dessert AND I got up this morning and ran 3+ miles which I made me feel energetic enough to reach the daily recommended NaNo word count goal by noon. A writer friend of mine posted 100 things she’s grateful for and I want to do something similar, but I’ll just post 5, because I need to get back to writing other things. 1. My friends. Each very important to me in a very special way. Some of them know this, but others may not be as aware. I tend not to express this as much as I’d like but I really feel grateful for the true friends I have in my life. I feel like I can reach out to them anytime and they’ll be there to listen, encourage, and make me jealous of the way they’re living out their dreams and aspirations. I feel very blessed to know you. 2. My job. I am glad to be employed at this time of year, but more so because I’ve been able to be a part of so many groups, activities, and events that my company offers, such as the triathlon team and the volunteer opportunities around LA. This past weekend I was able to help out at the LA Regional Food Bank with a group of nearly 150 other volunteers from work, plus their family and friends. It was very cool to see how a few hours of effort could make a difference in the lives of many hungry families in need. 3. Pie. Every time I have a slice it makes my week. Any kind of apple, peach, lemon meringue, key lime… do fruit tarts count as pie? They deliver the same feeling, so those too. 4. My car. The poor thing is 12+ years old now but it’s always been super reliable and for that I’m so grateful, as I save up my pennies here and there, just in case. I’m not one for vehicular complacency. 5. Access to high-speed internet 24/7. Because of this I have the ability to gather so much information for anything I can think of. I’ve learned so much over the last year that I would have otherwise not known, if not for the data connection. I hope all my fellow Americans who celebrate this day in a spirit of thanks and gratitude have a wonderful Thanksgiving and amazing start to the holiday season! Now to catch up on the word count for the days of writing I’ve missed. The goal is at least 8k by tomorrow evening.